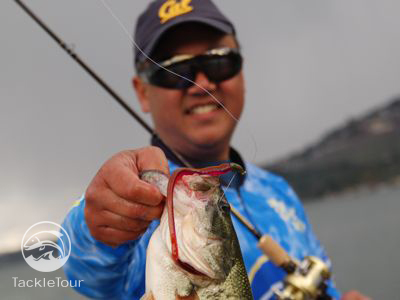 Drop Shot: Just about any soft plastic product these days, is used for this technique - even some soft bodied swimbaits! 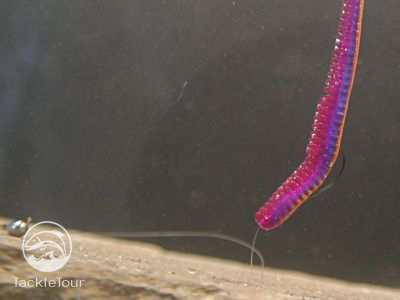 The original zipper and 4.5" straight tails are more along the lines of your traditional drop shot style baits, but the longer version of both worms can be effective in this technique as well. The Shakey Zipper rigged with a #2 light wire Gamakatsu worm hook and 6lb line with the weight off to the left side of the picture behaving like a Carolina or split shot rig. Split Shot/Carolina: This is where the straight tail worms really excel -in split shot or Carolina rig type applications where the weight is between you and the bait and the worm is left free to float up off the bottom. The straight tail worms have little twist and turn in them so fished on light line with a split shot, line twist problems are minimal. The original Zipper is just as buoyant. 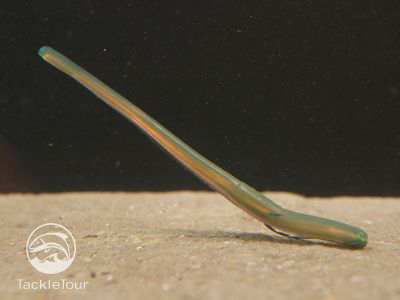 Features: So what makes the Roboworm product so different than the rest? Many soft plastic baits are poured with varying degrees of salt impregnation. 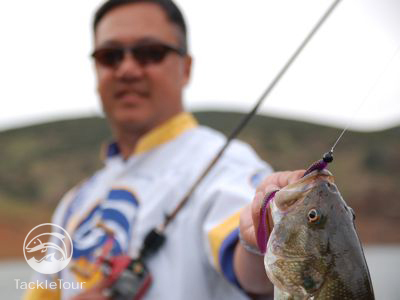 Roboworm does so with a custom engineered technique where the salt is poured within the bait right at the head. It is designed to release slowly over the course of thirty minutes, so where some baits simply have salt on the outside, Roboworm's system ensures salt stays in the bait, and released slowly into the water over the course of half an hour. Here again, the Shakey Zipper fully rigged on a Reaction Innovations Screwed Up Bullet Head. But another, very important factor in the Roboworm product is the softness of the plastic itself. They are almost the same as a hand pour - very soft and natural which causes the fish to hang on longer giving you a better chance at setting the hook before the bait is spit out. A rare photo of the Original Green Weenie rigged on a #2 light wire Gamakatsu worm hook. This is the worm that started it all for many West Coast hand pour worm advocates. Now where the Roboworm product differs from the hand pour is in consistency of the colors. From one batch of hand pours to the next, no matter if the same color was intended or not, there are invariably, inconsistencies between batches. Roboworm uses computer controlled machinery to precisely deliver consistent color and pattern time after time after time - hence the use of "Robo" in the company's name. The Original Green Weenie (left) compared underwater to an array of straight tail Roboworm product. Durability: Of course, with the soft, pliable, almost natural feeling plastic used in the Roboworm product comes the penalty of low durability. 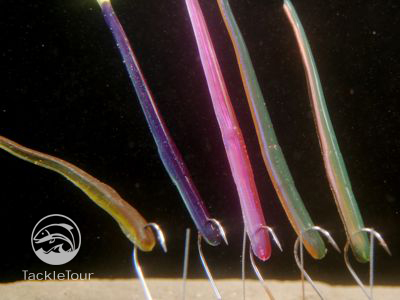 Depending on how you rig your hook point (skin hooked or right through the middle), these worms will last anywhere from one to maybe three or four fish tops. They do get torn up very easily and working your way through thirty worms on a good day fishing is not unheard of. Just know this and be prepared, because once you run out of that hot color, finding a substitute while out on the water can be aggravating. The straight tail finesse worm is how I developed confidence in bass fishing. Availability: Unlike the custom hand pours that were only available locally and sometimes at only one tackle shop, Roboworms are very well distributed and available quite readily especially if you shop online. Runs can and are still made on certain colors during certain times of the year, but re-stock is usually pretty quick. 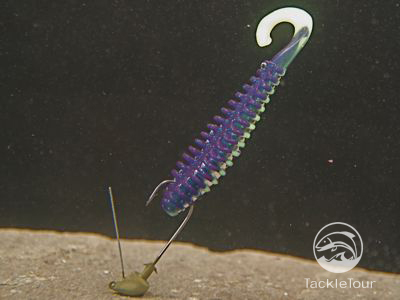 Roboworm's Shakey Zipper is a staple in my soft plastic arsenal. Conclusion: Plastic worms, specifically finesse plastics, continue to be a staple out on the West Coast, and present in just about every bass fisherman's arsenal out here is a bag or two, or three, or really, many many, more of Roboworm product. Their Shakey and Straight tail products in particular are great for everyone from beginners to veterans of bass fishing and the rigging options are limited only by your imagination. Heck, I even use the straight tail worms as trailers on spinnerbaits and buzzbaits. They add absolutely no action to these baits as trailers, but the added flash of color can be just the ticket sometimes. If you haven't tried these worms yet, you owe it to yourself to order a pack, but be careful, just like a good bag of potato chips, it's just about impossible to stop at just one.